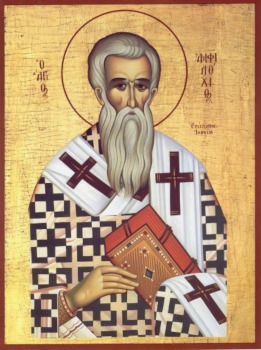 Sainted Amphilochius, Bishop of Iconium, was born in Caesarea Cappadocia, a city having given the world among the greatest fathers and teachers of the Orthodox Church. He was a first cousin to Saint Gregory the Theologian, and a close friend of Saint Basil the Great. He was their student, follower and of like-mind with them. Saint Amphilochius toiled hard on the field of Christ. Up until the time when the Lord summoned him for hierarchical service, he lived in the wilderness as a strict ascetic for about forty years. In the year 372 the bishop of Iconium died. Angels of the Lord thrice appeared in visions to Saint Amphilochius, summoning him to go to Iconium for hierarchical service. The truthfulness of these visions was proven by that the Angel, appearing to him the third time, sang together with the saint the Angelic song: “Holy, Holy, Holy, Lord Sabaoth.” The heavenly messenger led the saint to the nearest church, where an assembly of Angels consecrated Amphilochius bishop. The saint, on the way back to his cell, encountered seven bishops who were seeking after him through the command of God, so as to establish him as archpastor of Iconium. Sainted Amphilochius told them that he was already consecrated by the Angels. For many years Sainted Amphilochius tended the Iconium flock entrusted to him by the Lord. The prayer of the righteous one was so intense, that he was able to implore of the Lord healing of spiritual and bodily infirmities of his flock. The wise archpastor, gifted as writer and preacher, unceasingly taught piety to his flock. A strict Orthodox theologian, the saint relentlessly confronted the Arian and Eunomian heresies. He participated in the events of the Second Ecumenical Council (381), and he headed the struggle against the heresy of Macedonios. Letters and tracts of Saint Amphilochius are preserved, in which the completed form is combined with a profoundly dogmatic and apologetic content. The holy Bishop Amphilochius of Iconium peacefully expired to the Lord in the year 394.